Home » Help Center » How do I delete a registration? How do I delete a registration? At Regpack, we don’t allow for users to be completely removed or deleted from the system. Instead, we allow you to remove users from view using an archive status. Archived users will not count towards your number of users for billing purposes. The benefit of archiving users as opposed to deleting them, is that this way you will still have access to their information (in case they change their mind and do want to register), but they will not count towards your project’s total product revenue, or towards your total applicant count. 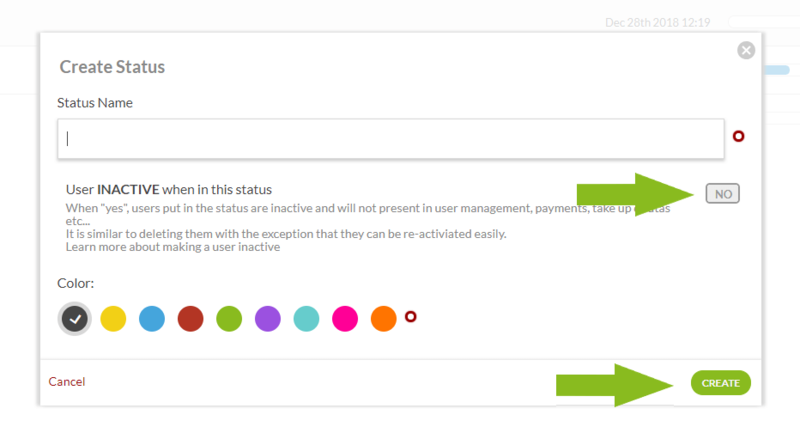 To set a user’s status, click on set status as (or their current status) on the right side of the screen when in User Management. Next, select an archive status from below the gray line. The system does come with two standard archive statuses: deleted by user, which are users deleted on the front end by the user, and test user, which is intended to be applied to test users created when the admin is testing the system. Administrators have the ability to create their own statuses to be applied to users, and admins can make archive statuses as well as statuses that can be applied to active users. Click on create new status to create your own archive status, or select one of our existing archive statuses. There is no limit to the amount of statuses you can create. For example, you could make an archive status for users who cancelled or did not qualify. This process both creates a special status that you can filter for and ensures that the user is not listed in user management where there is a list of users who have active registrations, keeping the numbers at the top of user management more accurate. 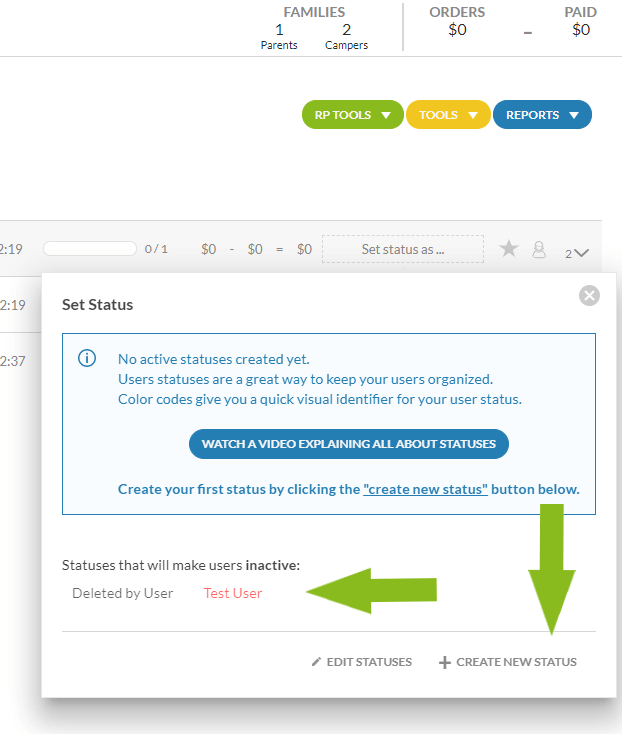 After clicking create new status, you can add in the name, color of the status, and you can turn on the archive status option “User INACTIVE when in this status”, then click the green “Create” button at the bottom right. NOTE: Users set to an archive status will be unable to edit their registrations. The system locks their registration on the front end and it will remain locked until you make them active again by removing the archive status. If the user tries to log in on the front end, they will receive an error message stating their account has been disabled and to contact the administrator. The admin’s email will be listed. If a user emails you about this, not to worry! 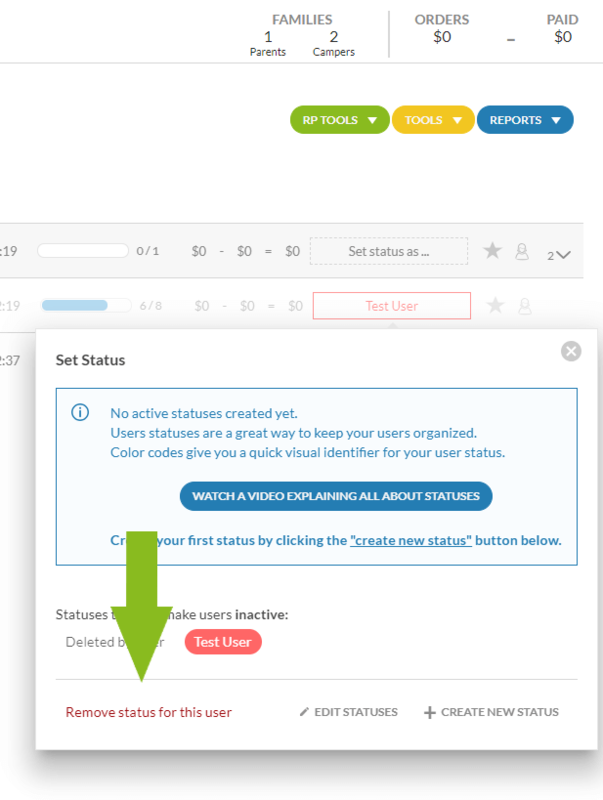 You can restore the user to active status by clicking on set status as –> remove status for this user. Next Article in this subject: How do I download content that’s been uploaded by users? What information does the e-signature capture? How do I add a child registration to a family? How do I download content that’s been uploaded by users?